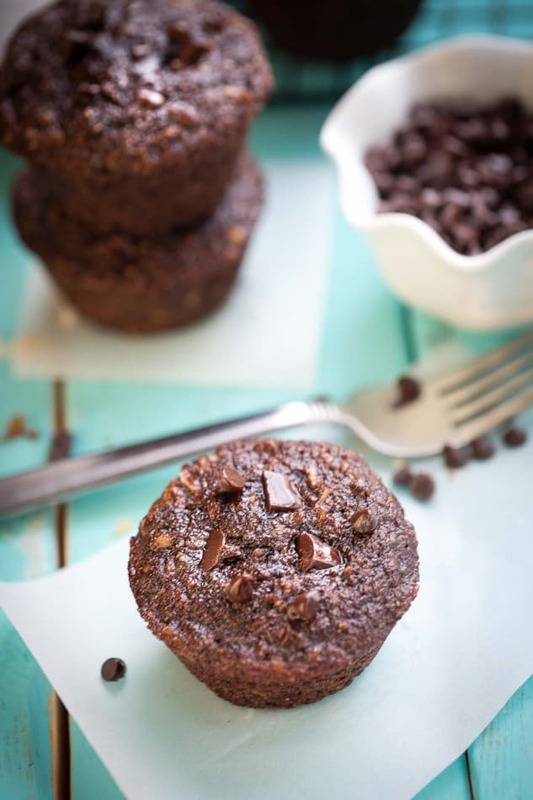 Skinny Flourless Double Chocolate Muffins are the perfect healthy breakfast. They are are lightened up with very little sugar and have no butter, no oil, and no white flour. Because it’s Friday and I figured we could all use a little bit of chocolate after a long week. But don’t worry, we are still keeping up with the healthier treats since it’s still January. 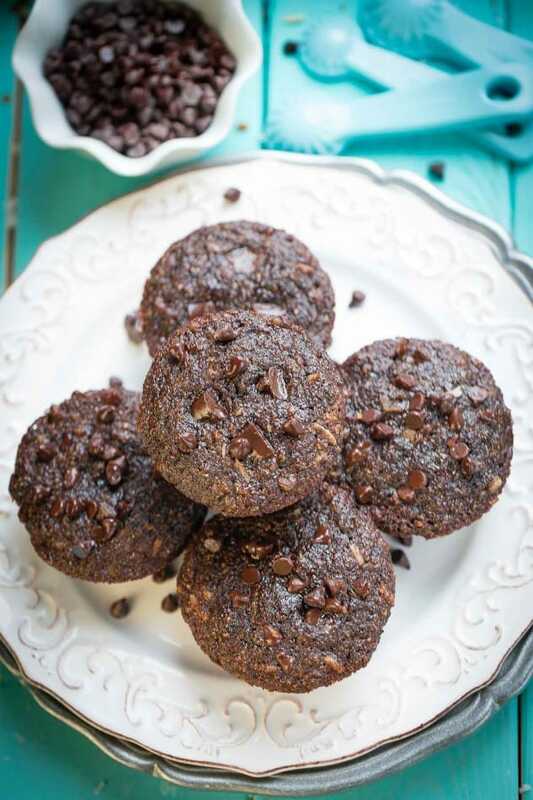 And you’d never guess that these double chocolate muffins are flourless. I’ve made a lot of low-fat desserts for my husband over the years trying to sneak in healthier ingredients — and he can ALWAYS tell when I’m trying to pull something on him. 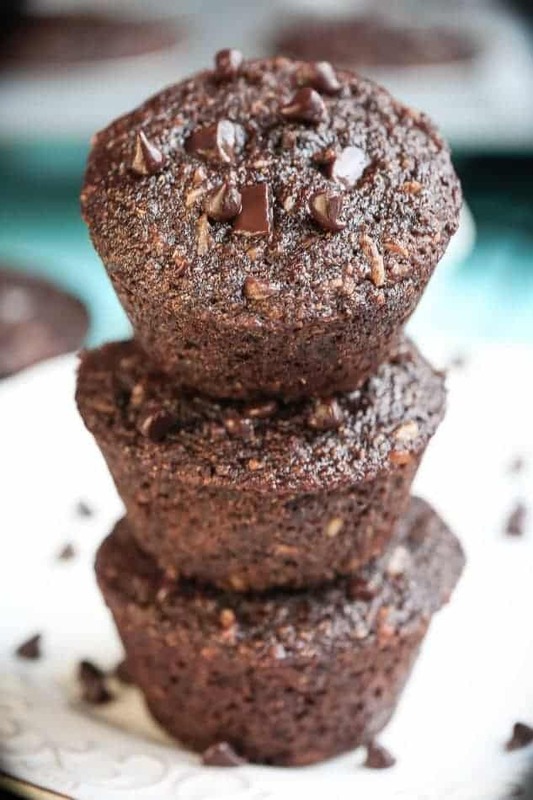 But these are different — I tested out a few batches to get them just right and they are chocolatey, moist and made with simple ingredients you probably already have in your pantry. They come together in about 10 minutes without the need for a mixer and have no butter, oil or white flour. 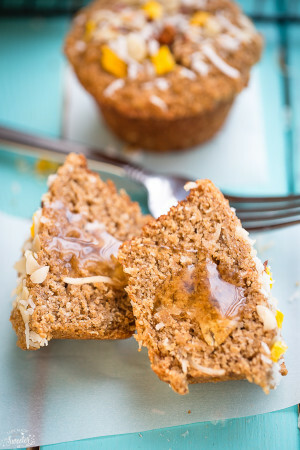 Instead, I used applesauce, Greek yogurt and oat flour – totally delish and practically guilt-free! Preheat oven to 415°F. Spray muffin pan with nonstick cooking spray. Do not use liners. In a medium bowl, sift oat flour, cocoa powder, salt, baking soda, and baking powder together. In a large bowl, whisk together egg and coconut sugar until smooth. Add honey, vanilla extract, yogurt and applesauce. Whisk together until smooth and no lumps remain. Gently fold in the unsweetened coconut and chocolate chips. Top each muffin with a few more if desired. Using a large spoon or cookie scoop, fill muffin tins 3/4 full. Bake at preheated oven for 5 minutes and then reduce the heat to 375 degrees and continue to bake for 5-7 more minutes or until a toothpick inserted in the center comes out clean.